Recently, over 40 workers at two separate Fresenius Kidney Care centers in Mobile, Ala., voted to join the RWDSU/UFCW Mid-South Council by an overwhelming margin. These workers stuck together through six weeks of anti-union rhetoric. The anti-union campaign included management bringing in union-busting “consultants” to shut down the organizing drive. 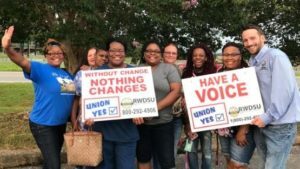 Despite these anti-union tactics, the workers were undaunted in their desire to make their jobs better by winning a union voice in the workplace.